Slater divided factory work into such simple steps that children aged four to ten could do it -- and did. While such child labor is anathema today, American children were traditionally put to work around the farm as soon as they could walk and Slater's family system proved popular. This industrial spy became the father of the American factory system. Samuel Slater has been called the "father of the American factory system." He was born in Derbyshire, England on June 9, 1768. The son of a yeoman farmer, Slater went to work at an early age as an apprentice for the owner of a cotton mill. Eventually rising to the position of superintendent, he became intimately familiar with the mill machines designed by Richard Arkwright, a genius whose other advances included using water power to drive his machines and dividing labor among groups of workers. In 1789, Slater emigrated to the United States. He dreamed of making a fortune by helping to build a textile industry. He did so covertly: British law forbade textile workers to share technological information or to leave the country. Slater set foot in New York in late 1789, having memorized the details of Britain's innovative machines. 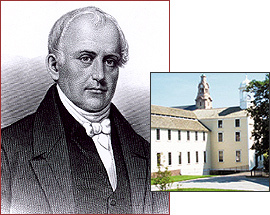 With the support of a Quaker merchant, Moses Brown, Slater built America's first water-powered cotton spinning mill in Pawtucket, Rhode Island. By the end of 1790, it was up and running, with workers walking a treadmill to generate power. By 1791, a waterwheel drove the machinery that carded and spun cotton into thread. Slater employed families, including children, to live and work at the mill site. He quickly attracted workers. In 1803, Slater and his brother built a mill village they called Slatersville, also in Rhode Island. It included a large, modern mill, tenement houses for its workers, and a company store -- a small pocket of industry, a ready-made rural village. Slater's factory system became known as the Rhode Island System. It was soon imitated -- and improved upon by innovators like Francis Cabot Lowell -- throughout New England. Slater died in 1835.